I just tweeted about this, but thought – hey! New year, new adventures, let’s get back to this blogging thing. I want to be more creative and flex my writing muscles more, so, perhaps, my first instinct shouldn’t be a threaded tweetstorm, but a blog post. Let’s talk about Bean and Moana. When I first heard about Moana, Disney’s latest animated adventure, I bookmarked it as something I’d like to take Bean to for several reasons. I want her to see strong, brave, smart, kind women on screen. I want her to see stories from other cultures and people. And I loved the idea of her seeing a movie – animated or not – that didn’t have a single white person in it. I also loved that there was no romantic subplot. We went to see it opening weekend, I think, and we both loved it. It was, simply, joyfully, a rollicking adventure about a girl finding her destiny and learning to trust herself. The music was pretty awesome, too. Then Bean asked to go and see it again, so we did. Then she asked to go and see it again, so my spouse took her. And she’s still asking if we can go see it again. She loves Moana. We listen to the soundtrack on a loop when we’re in the car (and sometimes during dinner). We read one of her Moana books every night at bedtime. She reads stories to her Moana tsum tsums and has tea parties with her Moana dolls. We are all Moana, all the time at Casa Celt is what I’m saying. But here’s what’s amazing to me. Bean is talking to us about Moana. She asking about character motivation. She’s asking why certain events transpire and what she thinks it means. She’s working out that there is more to the story than what’s on the screen and trying to figure what all of that means. It’s incredible to watch. To see her edging around discovery. To see her beginning to understand that stories are often deeper than what’s on the surface. And to see her actively trying to work out what Moana is all about. She’s beginning to think critically about things, to think symbolically about things. And it’s freaking amazing. She asks us what we think, tells us what she thinks. She wants a give and take, though she’s just beginning to understand what that is. It’s funny how little things like this make me realize what an unbelievable thing parenting is. How gobsmacking it is to watch a person forming and emerging. From my perspective, being the middle-aged woman I am, it’s so easy to take knowledge for granted because I know it. I understand what it means to interpret and dissect stories. I know what symbolism is. I know how to spot themes and subplots, how to speculate about character’s motivations. I forget that all of that was new to me at one point. That I had to learn that. Watching my daughter go through this discovery on her own, is humbling and wonderful. She is figuring this out, she’s beginning her journey. And it’s marvelous, in the purest sense of the world. I marvel at her, at her cleverness, at her imagination, at her empathy for fictional characters and their trials and tribulations. She knows the world is bigger than it seems. She’s beginning to see that our stories often are, too. I couldn’t be more proud. And I can’t wait to see what she discovers next. So, there’s a giant crab monster in Moana named Tomatoa. His species – as far as I know – is never identified – mostly because I think “giant crab monster” is about as specific as it needs to be. But, the key thing about Tomatoa is that he’s gathered shiny treasures and covered his shell in them. She’s learned about decorator crabs from watching Octonauts, but to make that leap knocked me over. She’s truly thinking about the story, about the characters, and trying to apply what she knows – her worldly 4 years of experience on this earth – to Moana. And she’s practicing being a good little biologist, too, what with the deductive reasoning for the species identification, too. Oh, she is my heart. I don’t know about you, but I often find myself earwormed by words and phrases. Don’t get me wrong, I also get the incessant jukebox repeat of songs, too. But, sometimes, it’s actually just language. A phrase. A word. Today, it’s “obliquity of the ecliptic”. It basically means the earth’s tilt on its axis. And yet … today, the phrase is leaving swirls of beautiful infinity in my brain. It feels peach-ripe with possibility and allure. All I want to do is stare at it, run it around my tongue and through my teeth, hold its weighty, surprising grace in all of my conversations. The obliquity of the ecliptic. It feels pregnant, a story waiting to be born, a world waiting to be tapped and pulled into existence. Perhaps I should get started on that. 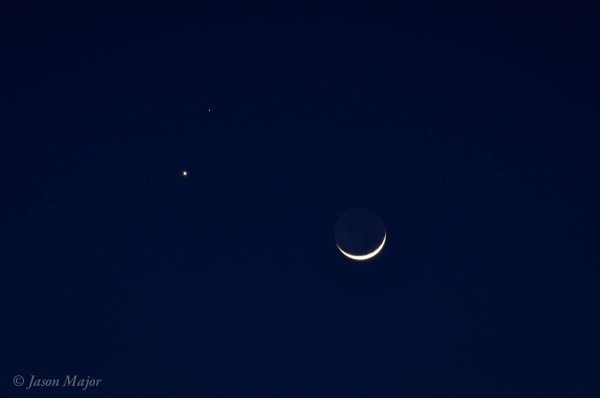 Conjunction of the Moon, Venus, and Mars on Feb. 20, 2015. © Jason Major. Did you have clear skies last night? If so, you may have been able to catch the sight above: a conjunction of the crescent Moon and the planets Venus and Mars in the western sky!